Two washing machines are going full throttle in the far reaches of Leicester Curve’s enormous backstage area. 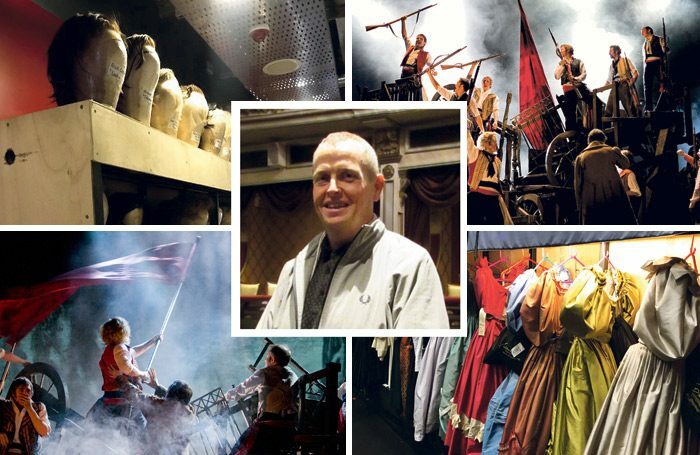 Chris Boone, production manager on the UK tour of Les Miserables, gives them a friendly pat. They’re a small but crucial part of the show that is on a two-year journey visiting cities including Manchester, Plymouth, Bradford and Cardiff. “Anything that touches the skin is washed after every performance,” Boone says, before adding that other costumes are washed on a rota basis. It all adds up to between 40 and 50 loads of washing per week. Late last year, Leicester was home to the 80-strong company for three weeks. This was where I met Boone, before the show was packed away again, loaded on to 16 lorries and restaged in Dublin. After that, the wagons rolled into Edinburgh where it opened earlier this week. On Friday lunchtime, six hours before curtain up, the building is a hive of activity. Technicians reposition the lights and run the sound checks; meanwhile the children cast for the next leg of the tour in Ireland are here in the Midlands to prepare. 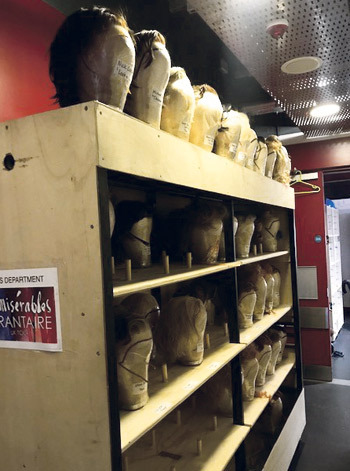 The costume department is brushing the wigs – there are 93 in all – and washing and ironing all the clothes, ready to go again. As an example, he reveals that during the planning stages for Mary Poppins there were fears that going from venue to venue with the show would prove a huge technical challenge. Mackintosh demanded that Mary had to fly, regardless of the theatre, Boone says. The impresario had made his feelings very clear. Getting the rigging for Poppins right in each venue was a real test, and Les Miserables is no less of a challenge thanks to the length of the tour and the tight schedule. Military precision is required to move 80 tons of equipment from city to city with sometimes just three days between the get-out and the new set-up. Every flight case, cable or prop has to be loaded on to the lorries in the right order and come out again in the correct sequence at the other end. 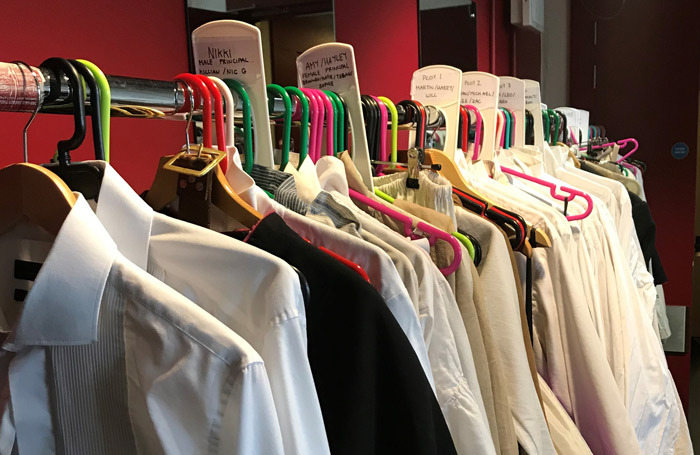 As well as lighting and sound equipment, costumes and more, each cast member is also allowed one suitcase of personal belongings – maximum weight 23kg – which are loaded on trailers supplied by theatre specialist Paul Mathew Transport. Weekend work on a farm. Operating the followspot in Sleeping Beauty in 1996 at Lyceum Theatre, Crewe. Working on a number of projects for Cameron Mackintosh Ltd. The working hours and days never get shorter. My parents and my stage manager at Crewe, Scott Ramsay – in fact everyone I have worked with over the years. Every day I learn something new. What’s your best advice for job interviews? Be yourself and don’t wear a tie. If you hadn’t been a theatre production manager, what would you have been? A golf greenkeeper or cricket groundsman. No, you make your own luck. Two versions of the scenery exist: an A-version and a B-version, though the difference refers to size rather than quality. Curve, with its 15 metre-wide proscenium arch, is the widest venue on the tour, while one venue – which has not yet been officially announced – is as narrow as nine metres. The get-outs begin at full pelt after the final curtain call with trailers backed up to the loading bay, though ‘deads’ and ‘empties’ such as flight cases and transport frames will have been loaded up two days beforehand. Aside from supervising staff and crew and linking with cast and creatives to ensure a smoothly run company, liaising with city councils to move these 45ft trailers through built-up areas is something else that falls under Boone’s remit, and he is quick to point out that some venues are easier than others. 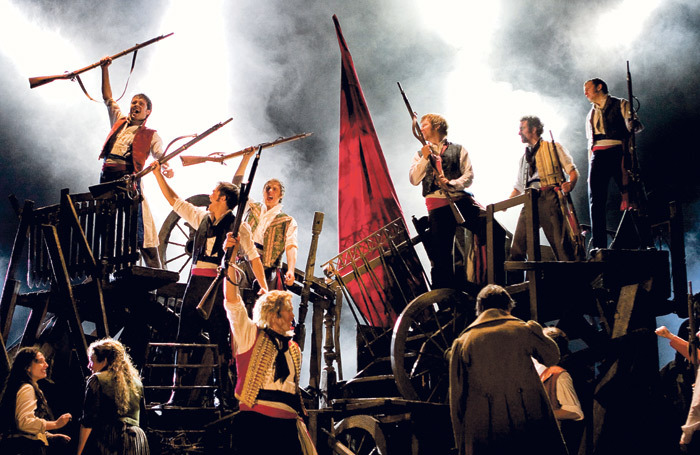 Les Miserables first toured the UK nine years ago to celebrate the show’s 25th anniversary but groundwork for the new version began more than two years ago. While Boone worked on Hamilton in the West End for much of this period, he began devoting his energy full-time to Les Miserables about five months before its Leicester opening. As the tour continues, it is this version that will replace the West End show in December.